The Around the World Conference is an experiment that brings together a research dialogue without the environmental cost of traditional conferences. Institutes and researchers are invited to participate either through presenting or by joining in the discussion. The conference is live-streamed world-wide and archived after the event. 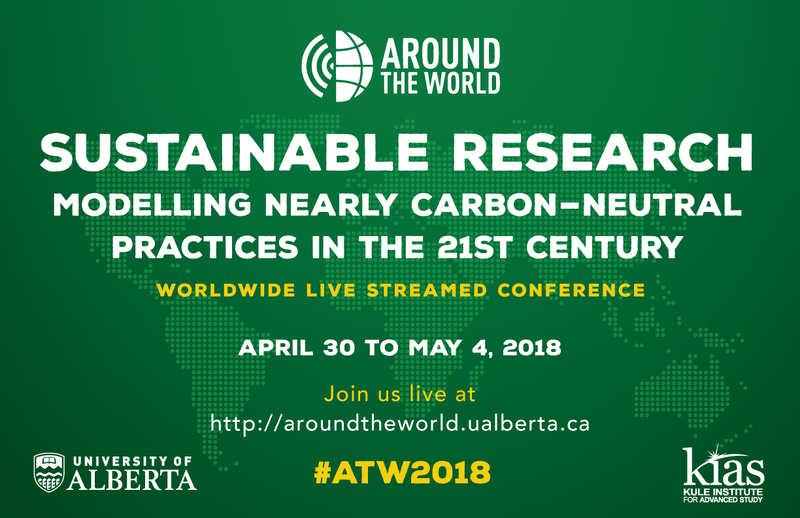 This Year’s Conference, Sustainable Research: Modelling Nearly Carbon-Neutral Practices in the 21st Century, will take place April 30 to May 4, 2018. Last year’s conference on Digital Media in a Post-Truth Era took place on May 4, 2017. You can find it in our Archive. Why the theme of “Sustainable Research”? Traditional conferences have a surprisingly large CO2 footprint. According to a recent study by researchers at the UCSB nearly one-third of CO2 emissions produced by university campuses come from flying to conferences and other academic related events. This conferences is an opportunity to stimulate discussion about sustainable research in its many forms as well as address the question of how we as an academic community can work together to learn how to better mobilize ideas without flying so many people. In terms of recorded video, we can accept just about any digital format. However, MP4 with a resolution of 1920X1080 is our preferred format. For those participating via video conferencing we are using Lifesize hardware over IP. Any VC hardware form Sony, Cisco, Polycom, or Lifesize made within the past 5 years should be compatible. Speakers also have the option to stream their presentations directly from their laptop computer via the Lifesize app (see technical requirements for more info). A more detailed description of the technical requirements/recommendations is available to download here: ATW-Tech-Requirements. Please don’t hesitate to contact us with any questions or concerns!